FieldScout TDR 100 Soil Moisture Meter, available from Envco Environmental Equipment , is a portable soil moisture measurement. The FieldScout TDR 100 soil moisture meter is a suitable tool for quick, reliable, and convenient measurement. 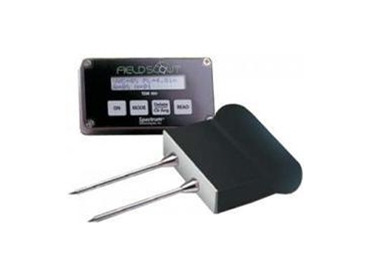 Whether in a field, greenhouse, or laboratory, the FieldScout TDR 100 soil moisture meter provides the desired results. Users can monitor and record soil moisture quickly and accurately with TDR technology. Based on the proven time-domain measurement technology, the portable FieldScout TDR 100 soil moisture meter accurately measures soil moisture across the full range of soil moisture conditions. Customers can select from the 12cm or 20cm (4.8 inch or 8 inch) probe rods to suit their measurement depth. The LCD interface provides two modes: volumetric water content and relative water content (irrigation management) mode. Hand-held design allows for easy transportation and storage. Units are connected by 5ft. cable and measures in less than one second. Measurement rods must be purchased separately for Field Scout TDR products.